New York - Online shoppers want their packages — now. And Amazon is spending heavily to make sure that happens. Amazon’s Prime service has, at heart, always been about free two-day shipping. The $99 annual subscription includes a variety of other goodies, but the near-instant gratification of fast, no-extra-cost delivery was the program’s original draw, and remains central to its appeal for its estimated 60 million subscribers. But fast delivery — everything from Prime’s two-day service to one-day or one-hour options, grocery delivery and delivery for third party sellers — doesn’t come cheap. In the April-June quarter, for instance, Amazon spent $3.88 billion on its distribution network, or what it calls “fulfillment,” up 35 percent from the prior year. The company spent $13.41 billion on fulfillment in all of 2015, up 25 percent from the prior year — and fully 13 percent of its $104.8 billion in total operating expenses. Such heavy investment is a big part of what keeps Amazon’s profit margins low relative to other big retailers. That’s intentional; the reinvestment has let Amazon open up new business lines such as its Amazon Web Services cloud-computing business, production of original TV shows and movies, and smart-home products such as its Amazon Echo device. Still, distribution spending remains a priority. Amazon’s parcel volume was an estimated 1 billion packages in 2015 — the same number that FedEx delivered three years earlier for hundreds of thousands of customers, according to Satish Jindel, president of shipping consultant ShipMatrix. With volume growing yearly in the high teens or 20-plus percent, Amazon “cannot rely upon third parties entirely to handle that large volume,” he said. Amazon has also increasingly focused on more futuristic methods of delivery. On Tuesday, the Seattle company said it will work with the U.K. government to test using drones for delivery. The goal is to eventually deliver packages by drones in less than 30 minutes. The company has also leased 40 cargo planes from Boeing and Atlas Air to create an air cargo network. 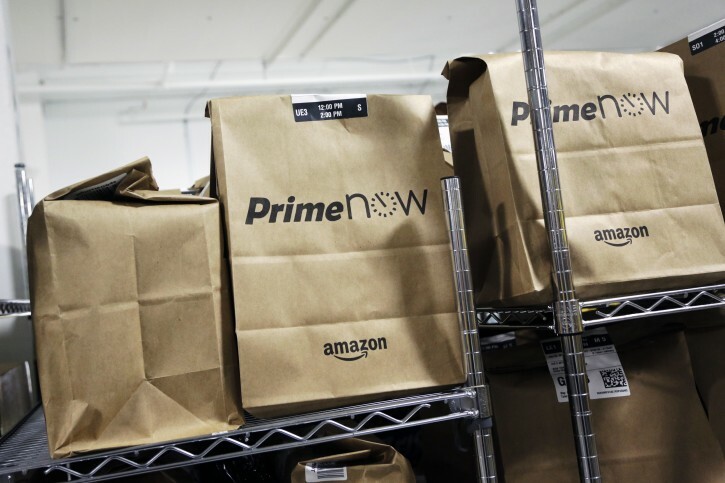 Amazon says it doesn’t plan to build its own delivery service, and is just looking to work more closely with package-delivery services such as the U.S. Postal Service, FedEx and UPS. Still, the cargo fleet and drone experimentation are clear steps in taking more control in the delivery process. On Thursday, Amazon reported second quarter net income of $857 million, or $1.78 per share, substantially beating analyst expectations of $1.11 per share. Revenue rose 31 percent to $30.4 billion, also beating analyst expectations of $29.55 billion. The company expects third quarter revenue of $31 billion to $33.5 billion, ahead of analyst expectations of $29.55 billion. Shares rose 1.3 percent to $762.60 in after-hours trading.